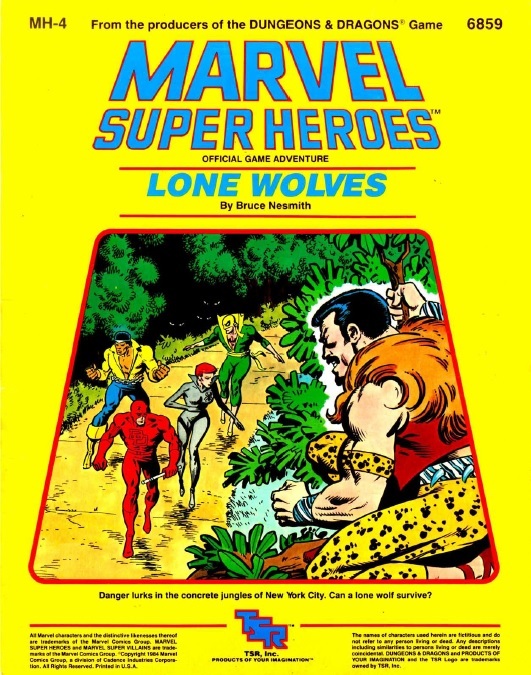 Lone Wolves is an adventure designed by Bruce Nesmith for TSR’s Marvel Super Heroes Basic RPG. It was designed for a small group of heroes with a focus on heroes who tend to work alone. The pre-generated characters included in this adventure include Daredevil, Black Widow, Power Man Luke Cage, and Iron Fist. The events of the adventure will bring the party in conflict with several notable villains of the Marvel Universe including Kraven, Sabretooth, MODOK, Vermin, and Taskmaster. The Kingpin also makes an appearance, though in this adventure he is not directly opposing the party. Like many of the old TSR Marvel supplements the module includes a fold out mat with maps of the locations in the adventure. The heroes are going about their own business. Daredevil and Black Widow have taken a charity case for a woman whose landlord is threatening to evict her because he believes her son is involved with a street gang. Meanwhile, Power Man and Iron Fist are trying to find leads as to who has been robbing a local store owner. The day is interrupted by news of a riot. As luck would have it the riot is taking place in the same area where the heroes’ clients are located. This gives the heroes an incentive to investigate. This can prove challenging because the heroes need to find a way to stop the riot without harming anyone (as stated in my original review of Marvel Super Heroes this game punishes players for unheroic acts and harming bystanders). The cause behind the riot is Vermin and Sabretooth. The two villains have unleashed a pack of genetically enhanced rats on the scene. Those bitten by the rats are filled with rage and the uncontrollable urge to attack anyone nearby. Fortunately, the adventure lists a couple of different ways the heroes can bring an end to the riot without hurting anyone. The next few events don’t quite flow together as smoothly as the events in some of the other Marvel adventures I have played. There are several subplots that involve Kingpin, the Punisher, and Kraven the Hunter. After the heroes stop the riot they need to find clues as to who caused it. During the middle part of the adventure They learn that Kraven stole some great cats from the zoo and crossed Kingpin by paying him in counterfeit currency. While Kingpin will appear to assist the party with information the game master is advised to keep in mind that Kingpin is not helping the heroes out of the goodness of his heart. He expects that the heroes will return the favor some day in the future (and crossing the Kingpin of Crime is not something to be taken lightly!). encounter: a warehouse hideout being controlled by MODOK and Taskmaster. In my opinion this is the strongest part of the adventure. The warehouse is staffed mostly by standard thugs but there are four cyborgs among the enemies to provide an extra challenge. The warehouse even has a “Danger Room” where the party will not only need to contend with thugs but also random obstacles like robotic tentacles and stun traps. The two toughest foes here will be MODOK and Taskmaster. MODOK’s main threat comes from his psychic abilities, and a hero without metal defenses can find himself in a lot of trouble if this villain gets the jump on him! Taskmaster is a physical combatant whose main power is the ability to learn an opponent’s skills and fighting style simply by watching him do it. What makes the Taskmaster so dangerous is if he has seen a hero fight then the hero is forced to take a two column shift penalty when trying to hit him. Taskmaster also has the ability to predict an opponent’s actions, forcing the player to announce his intentions at the start of the round. After the dust settles and all the villains have been arrested there is one final encounter designed to tie up loose ends. The heroes need to deal with their clients and the Punisher makes one final appearance. Overall, Lone Wolves is the kind of adventure that is probably best broken into separate scenarios. My main complaint about the adventure is the subplots involving Punisher and Kraven seemed tacked on to make the adventure longer. My other main complaint is the editing is rather poor, as there are a few noticeable spelling and grammatical errors. Like many of the old Marvel Super Heroes adventures it was written with a specific group in mind. The challenge with adapting this adventure to a different group is only one of the four characters (Power Man) has any sort of body armor, so most of the enemies inflict very low damage. 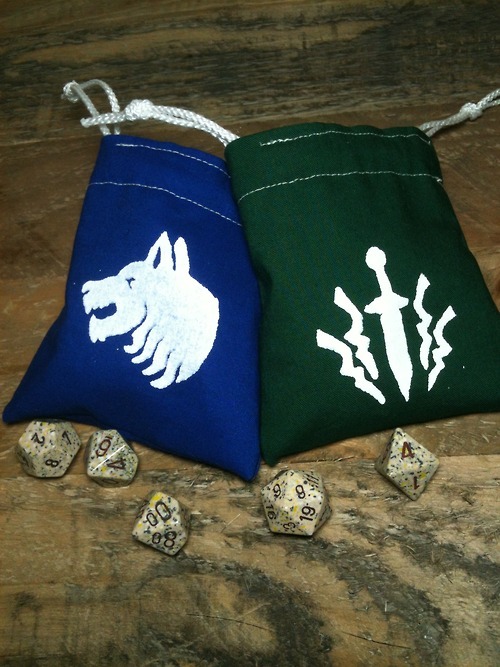 If you run this adventure with a different party you might need to make some adjustments depending on what type of defenses they have. The X-Men, Fantastic Four, or Avengers would find this adventure to be little more than a cake walk until they get to MODOK and Taskmaster at the end. Despite this it is still worth a look if you are running a Marvel Super Heroes campaign and are in need of an adventure that can be broken up into two or three scenarios.